‘Secret Superstar’ – Is Bollywood big-hitter Aamir Khan going to score large again with ‘feminist’ film? On October 19 (in time for Diwali) his first film since the box-office busting ‘Dangal’ (December 2016) will be released. Arguably now India’s biggest movie star with a string of consecutive hits, his latest film looks like another blockbuster. 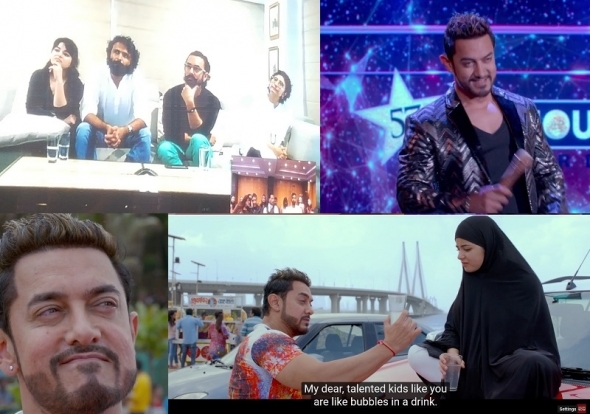 ‘Secret Superstar’ is already stirring hearts and minds through its trailer – over 3.5 million hits within 24 hours or so. It released officially at 2pm UK time yesterday (August 2). Also, yesterday in a special video link up with Mumbai, Aamir Khan who also has a producing role, as well as a starring one, talked about the film – alongside his wife and co-producer, Kiran Rao, director and writer, Advait Chandan (making his first film) and lead actor Zaira Wasim – to journalists in London. The story is roughly this – teenage school-going girl (Wasim) in small town India, loves music, playing her guitar and singing, but her Dad strongly disapproves – and in one pivotal scene in the trailer itself, actually rips off the strings of her guitar, leaving her heartbroken. Her mother is sympathetic to her ambitions – which is to sing professionally. Cue somewhere else, music superstar Shakti Kumaarr (Khan) launching some sort of music talent contest. In another pivotal scene in the trailer, Wasim’s character uploads a music video of herself to Youtube wearing a burkha – concealing her face and declining to identify herself. The insinuation is that she becomes a ‘Secret Superstar’. In essence, the film is about struggle, strife and having dreams and pursuing them. Khan said the burkha is ‘incidental’ but you can decide for yourself. After the success of ‘Dangal’ – India’s highest grossing movie of all time now and at £250m and counting…(thanks to more than half of overseas sales coming from China), who would bet against this being a superhit? All four talked about the main premise of the film – having dreams and pursuing them and not being side-tracked or diverted by others. Khan declared: “For me it’s like any situation for any girl or for that matter, any boy, where they are being stifled and they have to shake off the shackles. This film is about having your dream and pursuing them and not compromising them, no matter who is standing in front of you as an obstacle. Cue a small army of young girls in India (or anywhere really) rising up against their strict dads and telling them where to go – because superstar Aamir Khan Sir says so. While it may be easy to scorn or be slightly cynical about this type of (movie) sentiment, Khan and the others were sincere, believable and credible. And interestingly Khan said he hoped ‘Secret Superstar’ would have the same sort of effect his film ‘3 Idiots’ (2009) had more generally. “When ‘3 Idiots’ came out, it spoke to the entire youth, it made them feel they should be following their dreams, but it also spoke to an older generation and a ton of parents came up to me and said: ‘We were so hard on our kids, we were forcing them to do things they didn’t want to but now having seen the film we realise we should not have done that and we should allow our kids to follow their hearts and their dreams’,” revealed Khan. www.asianculturevulture.com asked how the film itself came about as the couple – Khan and Rao – as producers must get lots of scripts and ideas pitched to them. Rao answered: “Advait shared the idea with me before writing it and I remember connecting with it very deeply and wanting to read it. Aamir had heard it before. “It was very a fine piece of writing, it’s quite a human story and universal, all the characters are beautifully etched; there are a lot of layers, and shades and he has managed to capture the essence of middle class life in a very insightful way. Chandan, who has been Khan’s business manager for four and half years prior to this and worked with Rao as assistant director on her film ‘Dhobi Ghat’ (2010), explained that the original script was not complete and that Rao had encouraged him to complete it. He added: “I wanted to write about a teenage girl in small town India who has a lot of aspirations and how she gets there. Khan revealed that he had not been thinking about acting in the film initially. This character (as you will see from the trailer itself) is a parody and a send-up and looks to be great fun. For Wasim – who is returning to the screen alongside Khan after ‘Dangal’- said one element impressed her about the character. Rao also suggested there was a feminist angle to it. “Women and girls have been in the shadows for far too long and we have always had to struggle for our dreams, they are always second place, when they should be given the same rights as their brothers and the other people around them,” she said.